Not sure what products you need for quilting? Read our informative guides that tell you everything you need to know! Learn about the many different types of fabrics used in quilt making and their properties. Find out which fabrics you should use in your next quilting project. 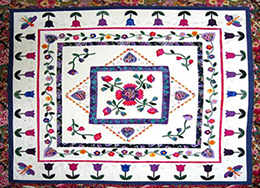 Learn about the different types of tools that are used for quilt making. We cover quilting machines, templates, pins, hoops, frames and other essential tools. When you have finished your quilt you need to work out where you will put it. Read about the different options you have for displaying quilts that go beyond using them as bed covers!